It’s that magical time of year again in Virginia’s capital city, where people from all over the Commonwealth come together for General Assembly. Virginia’s very part-time legislature can be a little intimidating to keep up with — especially in short session years like 2017 — so here’s some GA 101 to get you grounded. The Constitution of Virginia dictates the length of our legislative sessions and when they begin in Article IV, Section 6. 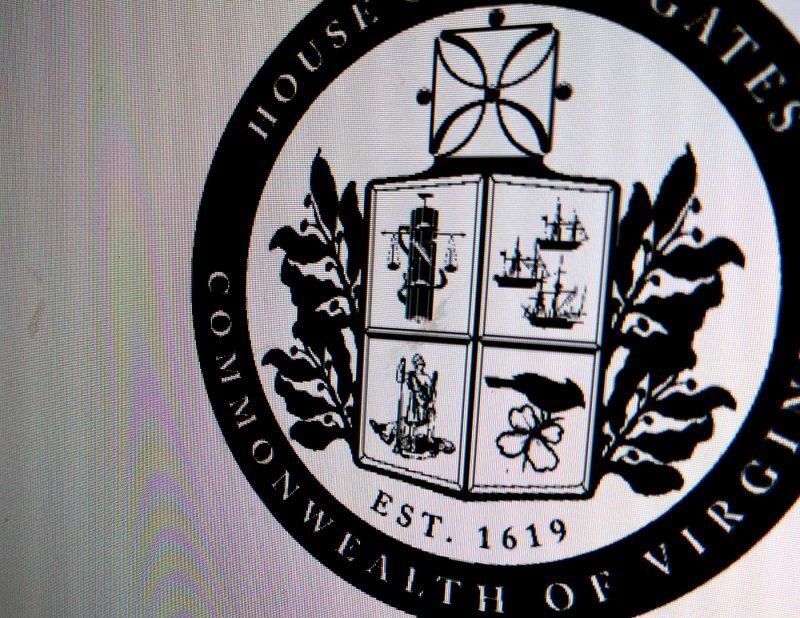 Unless the Governor calls for a special session, which is quite unusual and usually limited to addressing very specific emergency circumstances, this one brief window of time is the only time of year when Virginia’s body of statutory law, the Code of Virginia, can be updated, changed, or amended. Make no mistake either — the General Assembly session is brief. In even-numbered years, the session is 60 days long, and in odd-numbered years (like 2017), constitutionally prescribed to be just 30 days, though by tradition the members agree to extend it to 46 days. Every year, it begins on the second Wednesday in January. The members of Virginia’s 100-member House of Delegates and 40-member Senate then have just between today, January 11, and 46 days later, February 25, to make law. All over Richmond and the Commonwealth, the General Assembly Session Calendar has been printed out likely many hundreds of times and taped up directly in front of peoples’ eyes at their desks. The brevity of the General Assembly forces the body to adopt very strict deadlines for its work, and every one of them will be a struggle to hit. This means very long days for legislators, their staffs, lobbyists, issue groups, Executive Branch agency staff, reporters, and basically everyone whose work depends on Virginia law. Meetings will often be scheduled from the pre-dawn hours of the morning until very late at night. Just know that in General Assembly, things can happen really fast. Blink and you’ll miss it. Here on the first day of the 2017 General Assembly, there are already 1,585 bills sitting in front of the members, and the filing deadline is still nine days away, so that number will keep rising. The sheer volume of measures coupled with a short session means that the House and Senate have to divide up the work if they’re to have any hope of managing the flood. The House of Delegates has 14 standing committees, and the Senate has 11. The higher volume committees in turn have subcommittees underneath them, with snappy titles like “General Laws Subcommittee #3.” These committees and their subcommittees are where the vast majority of the discussion, presentation, and testimony takes place. There simply isn’t much time for any of that once a bill has made it to the floor. It’s important to be clear about this: a majority of the bills that members file will die before they reach the floor of the chamber where it was introduced. 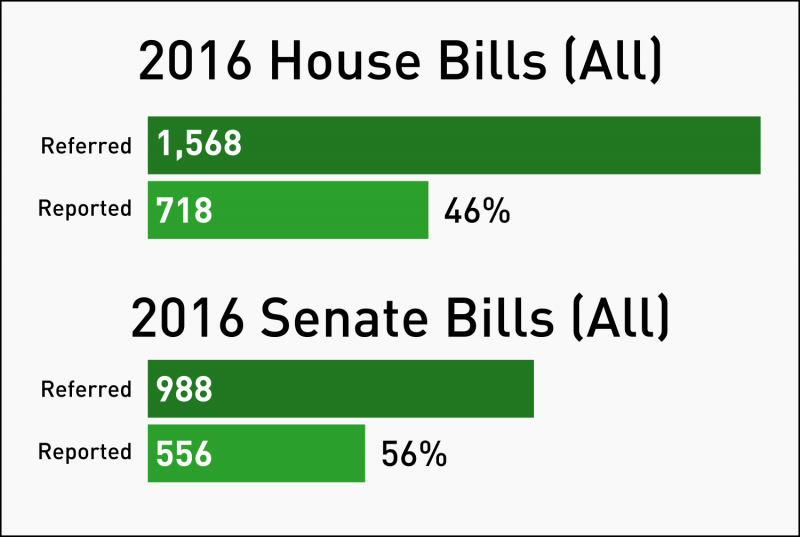 In 2016 session, House committees reported about 46% of their own bills upward, and Senate committees reported about 56%. Even though the bills that will appear on a committee’s docket are determined by the Speaker of the House in the case of the House of Delegates or the Clerk of the Senate in that body, committee chairs have a lot of authority. They decide how to order the bills, how much time to devote to testimony or discussion, and generally take the lead on when and how to move the committee. Fail to Report: Committee votes on a motion to report the bill. If the majority votes no, it’s dead. No Action Taken: Committee just doesn’t make a motion to report the bill. Same effect. It’s dead. Pass By Indefinitely (PBI): When a committee votes on a motion to PBI, it reserves the right to consider the bill at the next meeting, but far more often than not, that doesn’t happen. A PBI’d bill is almost always dead. Strike: Almost always, the bill’s patron makes a request to strike, which removes it from the committee docket and kills it. In way of contrast, they only have one way to advance a bill: a majority “yes” vote on a motion to report. They can choose to tinker with it before reporting though. The bill can be reported as is, but they can also report it either with amendments, usually minor technical changes, or as an Amendment in Nature of a Substitute, where the bill is essentially redrafted before passing it along. Committees have three additional things they can do with bills. They can incorporate, or merge, multiple bills together into one. In even years, they can carry over a bill, which just takes it off the docket for the current sitting General Assembly and move it on to the next. Since 2017 is an odd year, the session will open by considering the 242 bills that were carried over from 2016, but won’t carry over any bills itself. Finally, they can move for a rereferrral, which picks up the bill from their committee’s docket and puts it onto that of a different committee. Here’s the real kicker though: bills don’t just go through the committee wringer once. Each chamber begins the session working through the bills their own members introduced, but after crossover, every bill that was reported out of committee to the full body and then passed by that body will start the entire committee process over again in the opposite body. So if HB100 is reported from subcommittee to committee, then from committee to the floor, and the House of Delegates passes it, after crossover HB100 will be referred to an appropriate Senate committee, which will be able to process it precisely the same as if it was a Senate bill. For it to become enrolled — ready for the Governor’s signature — it must be passed by both the Senate and the House of Delegates. It’s worth noting that bills which have passed one chamber already tend to move more quickly through the committee process, and the report rate is much higher than in the chamber of origin. 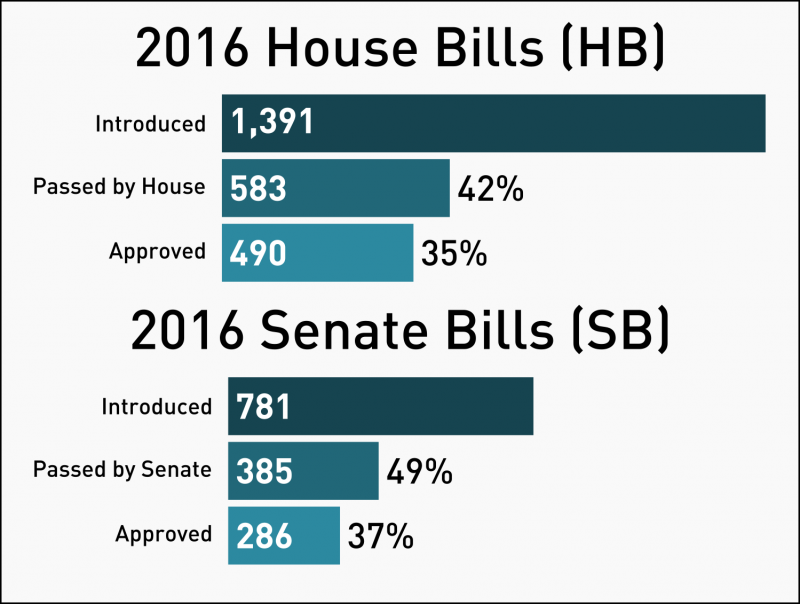 In 2016, Senate committees reported about 90% of bills the House of Delegates had passed on to the full body for a vote, and House committees reported up about 80% of Senate bills. Put all these elements together — a very short time window where a dump truck full of bills must each pass through a lengthy process with a wide array of outcomes, and often meet their final resolution quietly and suddenly in subcommittee with a voice motion to simply not vote on a bill — and you can understand why even the most dedicated members of the General Assembly press corps have to perform extreme triage to decide what to report on. With literally thousands of bills up in the air, there’s a good chance there will be some bills you would personally care a lot about one way or another, but don’t expect that to automatically mean there will be general-circulation coverage of them. This session will be like any other, where a small number of highly controversial bills and maneuvers, even some that are nearly guaranteed to be swiftly killed in committee, will get a lot of ink, and many others just won’t be discussed at all. When you see General Assembly reporters around Richmond this month, know they are basically working harder than it’s actually possible for humans to work, so please offer them a choice of either something caffeinated or alcoholic. Or both. They deserve it. Keeping up with your pet issues is where state-level issue advocacy groups come in. If there’s something you’re really into, you’re much more likely to hear about bills affecting that issue from them than you are from any other source, and chances are they know when it’s the right time to pull out the action alerts and when they think they can do better by quietly nudging a sponsor to strike something troubling. You shouldn’t be discouraged by the rapid pace of the General Assembly from contacting your elected officials, early and often, about things that are important to you. On the contrary: the firehose of bills means it’s not unheard of for a Delegate or even a Senator, to receive just one comment about a bill. That comment could be yours, and it could be right on the front of their mind as they walk into a committee to vote on a bill you think is critically important. You should go ahead right now and find out who your Delegate and Senator are. Write down their email address and phone number. Have them handy. Ask any legislative assistant and they will tell you in no uncertain terms that they absolutely keep track of constituent contacts about legislation, and share them with their members often. The most important thing when you’re making that contact is to be specific about what you want the legislator to actually do. Your phone call, or email, or letter, or even in-person meeting — yes, just anyone can schedule a meeting with their Delegate or Senator — should come from an explicit thing that you want them to do for you. Do you want them to support a bill in committee? Vote against it on the floor? Even seek an amendment you think could make it better? Go for it! Tell them! Virginia Legislative Information System is your best friend for keeping up with the status of legislation, committee and floor dockets and calendars, and all manner of other things. If you see a screen of a laptop or a tablet illuminated in the General Assembly Building, chances are about 80% that it’ll be displaying an LIS screen. It’s essential. DLS’s Virginia Law portal is your spiffy go-to for reading Virginia’s current laws and regulations, which you’ll certainly need to refer to for info on what a particular bill is modifying in the first place. Also from DLS, the Virginia State Budget site is an absolute masterpiece that I can’t believe we lived without before. It puts the entirety of both budget bills and amendments in one easy to review place. Next Next: On I-66, Virginia can have high peak tolls or gridlock. Pick one.